Learning a new language is always difficult, and has also traditionally been very expensive. 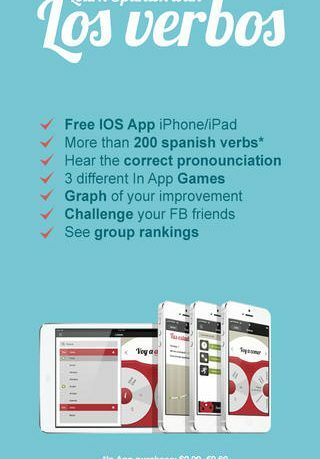 Yet, with this new tool for iOS, learning Spanish verbs is made easy- and free! 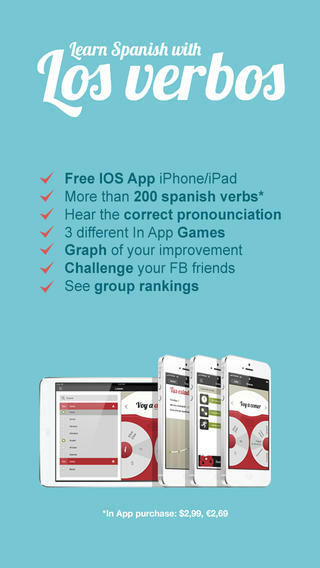 Los Verbos, available for iPhone and iPad through the iTunes App Store, is one of a new breed of apps. Apps that truly broaden the horizons of what the little device in your pocket can do, and also does it is a way that is visually appealing and endlessly intuitive. The app talks you through the learning process, with just the right amount of handing holding. You will soon be completely up to date with Spanish verbs, and how they work. It is surprisingly smooth to use, with an intelligent design ethos running all through the app. There are no barriers here, not even a cost barrier, as the app is free. – 8 different verbal forms: Presente indicativo, presente progresivo, pretérito indefinido, pretérito imperfecto, pertérito perfecto, futuro simple, futuro de intención, imperativo. The app is also really nice to look at, and comes with a premium feel, which is impressive for a free app. Other apps of this type will charge you through the nose for similar features. You get 5 verbs to master in the initial; free download, and can purchase 200 more as a very reasonable $2.99 in-app purchase. This way, you can see if the type of learning on offer suits you before you decide to go any further. Overall, this is an intelligent, feature packed and attractive app that should be snapped up by any potential Spanish speakers everywhere.